There has been oil leaking from the rear of the engine on the RP Box Saloon for several months. Every time the car was used it seemed to drop a quantity of oil onto the drive after a run but it didn’t seem to use much oil. I guessed it may have been a problem with the rear crankshaft oil seal having fitted one of the rubber replacement seals the last time the engine was out. I then experienced a lack of oil in the gearbox so I changed my mind about the incontinence problem, now believing it to be gearbox oil that was being dropped onto the drive. 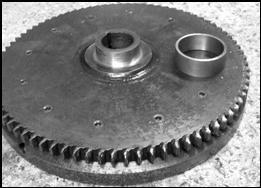 The Flywheel and Collar machined. I took the engine and gearbox out to see if I could determine where the oil was coming from. The bell housing did not seem to be too badly contaminated with oil and the clutch was clean and dry; no help here ! In the absence of any definitive reason for the oil problem I decided that my only course of action was to modify, repair and adjust the engine to minimise oil leaks around the crankshaft and gearbox shafts. Austin did not use oil seals as such for the rear main bearing, nor both the input and output shafts from the gearbox, they all rely upon a scroll in the stationary part of the ‘seal’ which guided the oil back into the engine or gearbox by the close proximity of a revolving shaft. I understand that this system was also used on the ‘Marina’ gearbox and was the subject of an after sales modification with the system being replaced by rubber oil seals. This then was my proposed course of action..
Machined back to . . . . .
As the rear main had already been fitted with a rubber oil seal I needed to examine this carefully to see if it was lacking in some way. 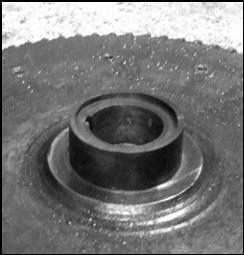 After careful consideration and research, the Internet is a wonderful research tool, I realised that the surface of the flywheel boss, upon to which the rubber oil seal fitted, was not sufficiently good to effect a good seal, any little pit or irregularity will allow oil past the seal. 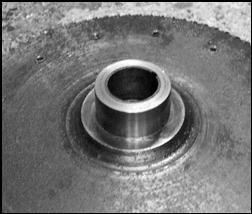 The surface needed to be skimmed in a lathe and polished but that would make the bearing surface undersize in relation to the oil seal. The answer was to turn down the outside surface of the boss on the flywheel by 1/16” and then make up a collar which was heat shrunk onto the flywheel. This was then skimmed in the lathe back to the required size and polished to a fine finish. Now when the oil seal is placed over the flywheel boss it fits well and hopefully seals well. This article, written by Malcolm Watts, originally appeared in CA7C Seven Focus in Apr 2007 pp18-19.